Torrance, Calif., April 30, 2012—Toyota Motor Sales, U.S.A., Inc., will debut the all new RAV4 EV at the 26th International Electric Vehicle Symposium (EVS26) in Los Angeles. Toyota’s news conference will be held on Monday, May 7 at noon in the West Hall of the Los Angeles Convention Center. Credentialed media can receive complimentary EVS26 registration by visiting www.evs26.org. The new Toyota RAV4 EV is the result of the Tesla-Toyota partnership, features a Tesla-provided electric drive train, and is an all-electric SUV built on a RAV4 chassis, manufactured by Toyota, specifications to be unveiled next week, and launch expected in July 2012. USA: Episode 60 – Electric Drive Transportation Association Gears Up for EVS26 in L.A.
Gamesa and Toyota Spain are joining forces in the field of energy-efficient mobility, signing a collaboration agreement to boost the use of electric vehicles in urban Spain. For six months the company will test the Toyota Prius Plug In to analyse its technology and the charging infrastructure needed to facilitate near-term mass rollout in Spain. Until we see big changes like a price on carbon or an affordable, scalable source of clean energy, it’s probably best to focus on small moves that can add up to a big difference. First, I wish to congratulate the writer’s success that he can afford to choose between BMWs and the Volt. Everyone has the right to rise in this country. I am responding to Pat Skrable’s April 23 “Another View” article, “Free market killed Chevy Volt, not the right wing, as libs say,” which alleges that the Chevy Volt is dead. Skrable ought to go to 3Way Chevrolet and test drive the very car he claims is dead. He will find that demand has outstripped production. Indian car giant Tata is believed to have ditched plans to introduce an electric car in the UK. ELECTRIC car drivers could get prime city parking spots free of charge under legislation being introduced by Transport Minister Leo Varadkar. New measures to allow local authorities to reserve certain parking spots for electric vehicles — and waive or reduce parking charges for their use — are set to be tabled within weeks. New incentive involves lowering purchase tax on vehicles that pollute less, resulting in a saving of NIS 6,000 to NIS 10,000 for car buyers. Motorists who buy electric-powered cars and some hybrid cars are to get additional tax benefits in a bid to encourage more Israelis to purchase these greener models, Finance Minister Yuval Steinitz announced on Sunday. It’s been nearly two years since Toyota announced its collaboration with Tesla Motors to bring electric variants of the RAV4 to market in 2012. We first got a glimpse of what that model might look like through a demonstration prototype unveiled at the 2010 L.A. Auto Show. If you’re shopping around for a new car, you may be considering one of the many electric vehicles (EVs) currently on the market. But will an EV really cut your fuel costs? And which type of EV works best with your driving habits: an all-electric car like the Nissan LEAF or a plug-in model like the Chevy Volt? THE WOODLANDS, Texas –– There’s something electric about Market Street. Two all-electric charging stations, the first in The Woodlands, have been installed on the first level of the Market Street parking garage. When California and NRG agreed to build new electric car charging infrastructure, it meant new jobs, new careers, and new job training programs, geared to training the workforce required to build and maintain infrastructure to support electric cars. AT the moment there are more electric car charging posts in the UK than there are electric cars – but a Luton company is ready to lead a transport revolution. Chargemaster, in Capability Green, reckons over the next few years there will be an explosion in the number of electric cars on the roads, using its products. 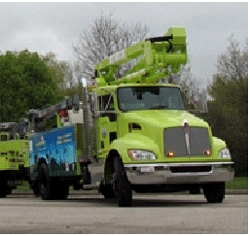 Just in time for Earth Day, new hybrid signal and street lighting maintenance vehicles will reduce emissions, lower fuel costs and create quiet environments. Will Prius Plug-in Owners View the Plug As Optional? The Toyota Prius Plug-in Hybrid went on sale in the past few weeks, without the fanfare that usually accompanies rollouts of new plug-ins. As I reported for KQED, Toyota hasn’t made a big deal of the plug-in Prius, because the company sees it as an extension of its hybrid offerings—rather than something novel. In other words, the PIP is a hybrid first and a plug-in second. Enclosed Electric Motorcycle An Industry Changer? In the moments after Daniel Kim narrowly escaped from under the 500-pound Land Rover chassis that he was welding, he decided that he needed to rethink his ideas about vehicles. The world of electric cars is an exciting one where almost every week brings you a new chapter of this great adventure. With each new day, better ways of extracting more efficiency of a battery pack and an electric drivetrain is being discovered. SMYRNA — To Infiniti and beyond! A leading UK engineer says the greenest cars on the market by 2020 will emit fewer harmful emissions per passenger than electric trains. Autocar reports Richard Parry-Jones told a transportation conference in London that current industry targets put hybrid and plug-in cars on track to outperform the cleanest trains in the UK’s high-speed fleet. When someone mentions switching to solar power, we often envision photovoltaic panels fixed onto the roof of a house or lined up in a field.